One hundred million pennies for your thoughts on the latest display in Rockefeller Center. New York first lady Silda Wall Spitzer joined hundreds of public school children on Monday to unveil a mass of $1 million in pennies collected for charity. 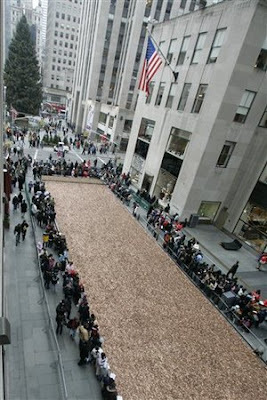 The display, called the Penny Harvest Field, includes an estimated 100 million pennies - plus a few nickels, dimes and quarters that slipped in by mistake. The exhibit, 30 feet by 165 feet, as long as a city block, is the culmination of the nonprofit organization Common Cents' 17th annual Penny Harvest, a national educational program designed to teach children about their value as contributors to society. Hundreds of thousands of city students from more than 800 schools spent the weeks between Oct. 22 and Thanksgiving going door to door and collecting the pennies, which will be donated to organizations of their choice for causes such as protecting the environment and helping the elderly. The exhibit was designed by architect James Polshek and will be on display in Rockefeller Center, near the famous Christmas tree, through the end of the year.